Posted October 23rd, 2014 - News Posted for ISA News. The Claro ISA 50th Anniversary World Surfing Games begins Friday with the Opening Ceremony featuring the Parade of Nations and Sands of the World Ceremony. All 22 National Teams and over 150 Athletes and Team Officials will gather and parade around Lima’s iconic “Plaza de Armas” in the center of the city, in front of thousands of local spectators. During the Opening Ceremony, each National Delegation comes to the stage waving their national flag while pouring sand from their local beach into a glass container symbolizing the peaceful gathering of nations through the love of surfing. 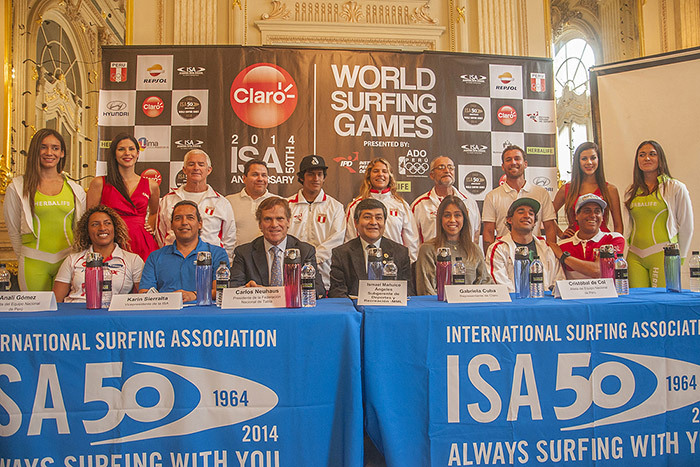 Thursday, the official press conference of the Claro ISA 50th Anniversary World Surfing Games took place in the majestic Municipal Theater of Lima, where over 40 representatives of Peru’s leading TV, print, and online media outlets were present. In attendance were ISA Vice President Karin Sierralta, Municipality of Lima Manager of Sports and Recreation Ismael Mañuico, Peruvian Surfing Federation President Carlos Neuhaus, Presenting Sponsor Claro’s Gabriela Cuba, Peruvian National Surfing Team Members, Analí Gómez, Sebastian Alarcon, and 2011 ISA World Junior Champion Cristobal De Col.